Though it has been overshadowed by Wednesday’s raid on Nine Zero, Islamabad High Court’s decision to drop terrorism charges against convicted target killer Mumtaz Qadri has important implications for society. Qadri’s killing of then governor of Punjab Salmaan Taseer is the very definition of terrorism. It was an undisguised political act meant to send an unambiguous message of fear and intimidation to the public. It is rather disappointing that a man being shot 32 times in broad daylight by a lunatic in the name of religion doesn’t qualify as terrorism in the infinite wisdom of the honourable judges. Questions are beginning to arise whether the decision was a foregone conclusion, and whether prosecutors actually conspired to bring it about, but let us ask the question which no one wants to ask: What would it say about our society if the Court would have let the terrorism conviction stand? Remember, this is a convicted target killer who at least one MNA said should be released. Lawyers showered him with roses. Religious groups applauded his crime. Social media groups supporting the confessed killer sprout up like weeds across the internet, and offline a mosque has been named after the killer. As depressing as it is, a confessed murderer is seen as a hero in much of the country. 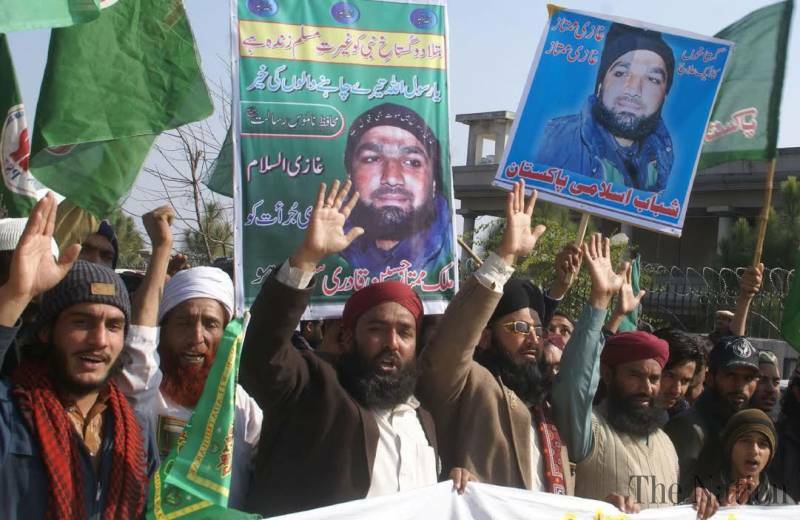 We can dismiss the antics of Abdul Aziz as representative of a small minority of extremists, but support for Mumtaz Qadri is widespread, possibly even considered as mainstream in some places. If our own Court had termed him as a terrorist…what would that make a society that praises him…? This entry was posted in Blogs and tagged judiciary, Mumtaz Qadri, terrorism by Sidra Jafri. Bookmark the permalink.